Please make note of animals still looking for families. Their "Family" is listed as "Frosted Faces Foundation." View biographies and more photos at Available Frosted Faces, learn more about becoming a family and the different programs we offer. You can also help fund their care by registering as their monthly sponsoring Fan. Tribute: There is one person's voice I do not want to hear at 8:00am and that is Dr. VanMaele's. This timing has become all too familiar as San Diego Bay Animal Hospital has cared for our Frosted Faces for over three years. I know she hasn't gotten to the hospital yet, but she bears the burden of relaying the bad news that morning staff report. Quincy did not make it through the night. We rescued 9 year old Quincy on January 21st, 2018 from Downey Shelter after he came in as a stray. He was hospitalized for two days with oxygen, nebulizing treatments, antibiotic injections, and fluids. We actually thought he was doing better yesterday and discussed discharging him last night. He looked bright, his oxygen saturation was normal, and he seemed comfortable aside from some boogers. We decided to keep him in the hospital's care for one more day because he wasn't eating yet and we thought by today he may. 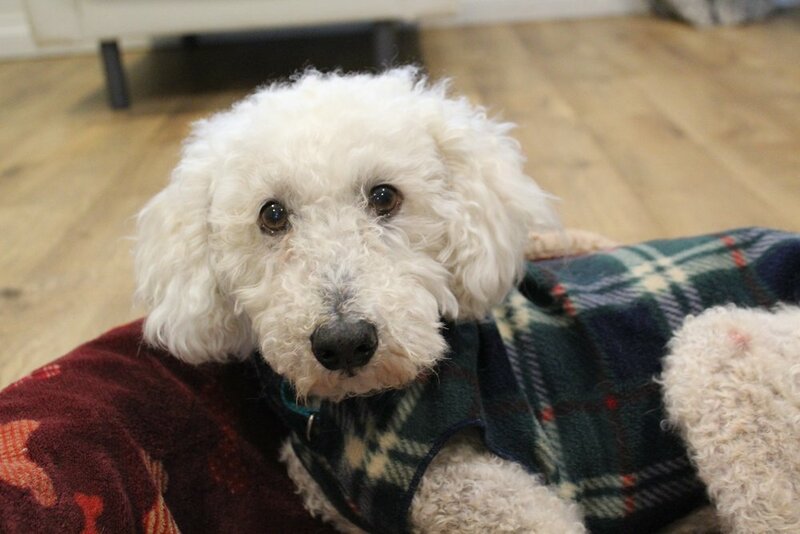 We learned in x-ray that his coughing was a result of horrendous collapsing trachea which we suspect ultimately ended his life because it was such a sudden unexpected decline. Other suggestions of cause of death were a possible unidentified sternal mass or a blood clot. Silence sets in and tears well up. There was no grand final good bye, no perfect beach day, no last amazing meal. I can tell you we spooned on the bathroom floor for a good part of Sunday evening. He got a warm bath to soak off all the urine that had caked on his legs due to his immobility at the shelter. 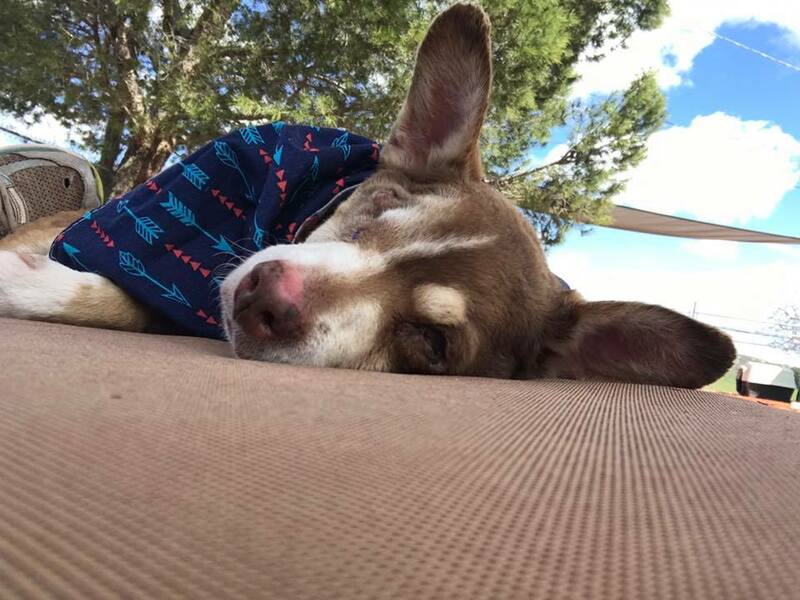 I think where I will rest easy is that we are blessed with adequate funding because of your generous donations that allowed us to give Quincy a fighting chance with no reservations. I am happy that we had the opportunity to support Quincy, rather than seeing him euthanized without justification. Thank you. Thank you to Mary Havens for registering to be Quincy's monthly sponsoring Fan and offering him the gift of hope. Dear Quincy, we loved you. Tribute: On April 10th, 2018, 8 year old Betty passed away. We acquired Betty, formerly Louise/Fauna, from Hope For Paws just recently on January 30th, 2018. 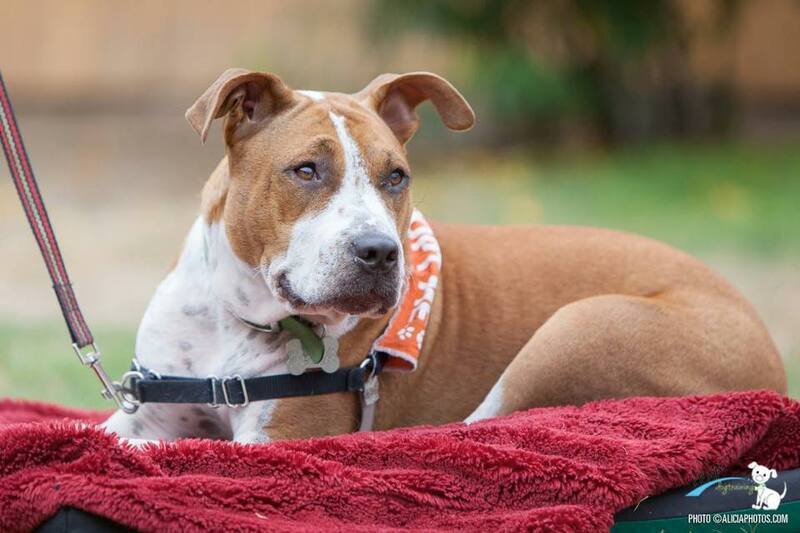 She had been surrendered into their care when her owner went to prison for a very long time. They did complete diagnostics, even performing dental surgery and removing lipomas. She wasn't at Frosted Faces Foundation very long, because she was SUCH a good girl. She was adopted on February 19th and just last week her moms noticed she was struggling to breathe so they rushed her to the vet. They tapped 3 liters of fluid from her lungs! They did all of the recommended diagnostics, no masses, no heart issues, no evidence in the fluid itself, and all they could deduce was that she had some kind of cancer causing the fluid build up. Sound familiar? Multiple vets recommended euthanasia to prevent suffering during more fluid accumulation and Betty's family lovingly let her go. "Goodbye, our sweet Betty. You came into our lives for such a very short time, but brought so much to our little family. You were a gentle soul, the depth of which could be seen in your beautiful brown eyes. 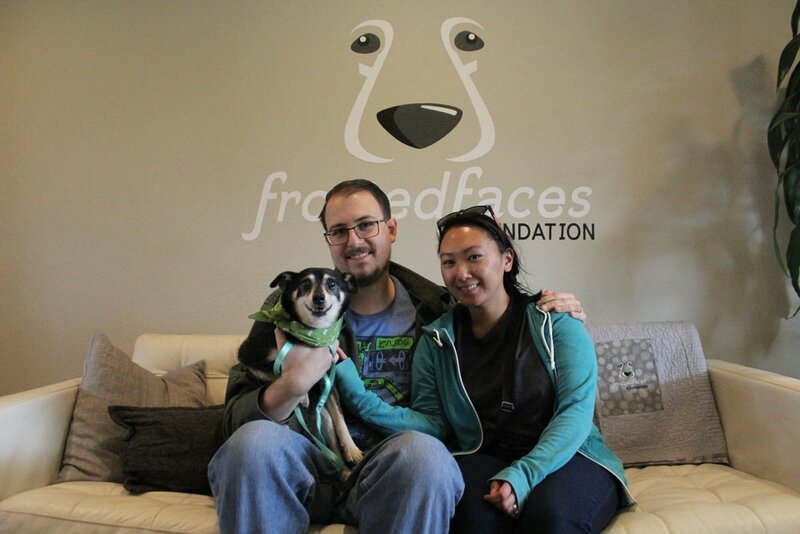 We are so grateful that we could give you a home filled with love at the end. Be free, and know that you will always be with us. 💕"
Paulette Gagnon and Nancy Atkins, I know your hearts were not prepared for loss so soon. Thank you for stepping up to the responsibility of caring deeply and letting go unselfishly. Thank you to Renata Santeli for being Betty's dedicated monthly sponsoring Fan. These photos are worth a thousand words and one very important promise fulfilled - family. Tribute: On Wednesday, January 9th, we fulfilled our promise to 18 year old Cilly. Recall that when we rescued Cilly she had a 1.5 pound mass attached to her tiny body. San Diego Bay Animal Hospital did a miraculous and successful surgery to remove the mass and Cilly went on to find family. Gosh, she was a fighter! She moved unbothered by her mass when it was there, and she floated once it was gone. The least we could offer her was a warm bed and tummy rubs. Imagine how long it must've been since she got those! "This pretty little girl passed last night in her sleep. We knew her cancer returned, but it didn’t seem to impact her energy or happy demeanor. Cilly will be missed, but we are so happy we were able to make her last 10 months filled with love and spoiling." Tribute: On Saturday, October 13th, we fulfilled our promise to 10 year old Viviana. We rescued Viviana from Bonita Shelter on March 13th, 2018 after she had been surrendered by her owner. She went on a two week Frosted Fling with long time FFF volunteer, Angela, and never came back! In June Viviana had a high blood pressure and was continually bloating so we performed a gastropexy, and also did a splenectomy while we were in there because her spleen did not look healthy. After a long recovery we thought we had managed the source of the problem, but on Saturday Viviana's heart was struggling again and we could not find a solution so we had to end her suffering. "Our sweet Viviana, Vivinator, Vivi girl, Vivenstein. All the nicknames that different members of our family had for you. I can’t believe you’re gone. You read these tributes and your heart hurts for the families and when it’s you writing one, it feels surreal. 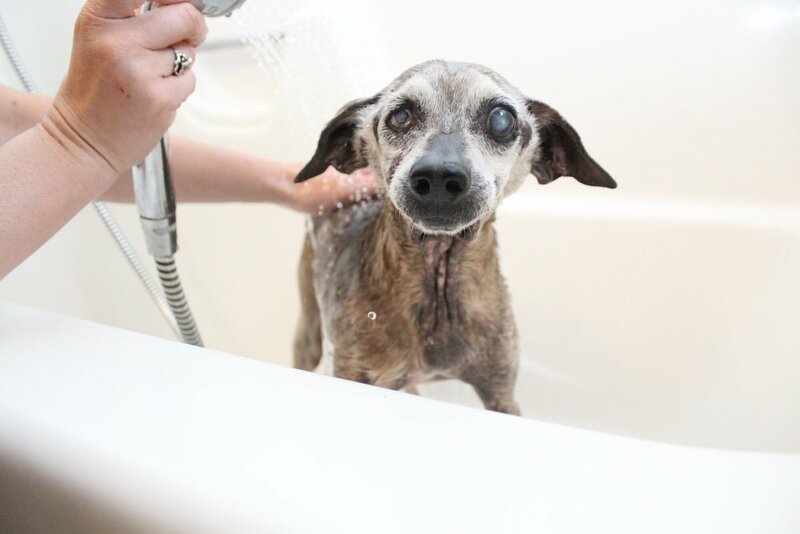 The first time I met you when I gave you a bath as a volunteer at Frosted Faces, I had no plan I would end up taking you for a temporary foster situation, then quickly deciding to keep you as a forever foster. You immediately fit into our pack complete with the cats like you had always been with us. So many little things will now be different. You filled a place in our hearts and home we didn’t know was missing. You never grew back the fur on your tummy completely from your emergency surgery in June in which you fought and survived against odds, but after months of medicated baths the fur on your backside was just now finally starting to look full and your cement sores were healing after a previous life of living outdoors. 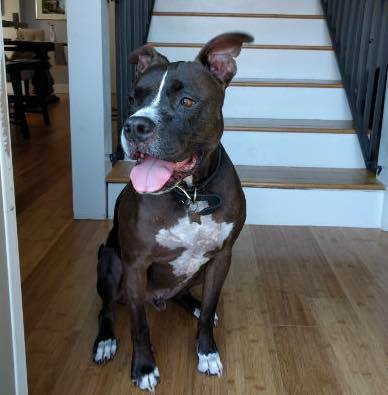 We learned you loved bully sticks, chasing tennis balls and had a pecking order of who you gravitated towards depending on who was home at the time as you never wanted to be far from your people. I think we heard you bark a total of three times and you were so patient with playing dress up. 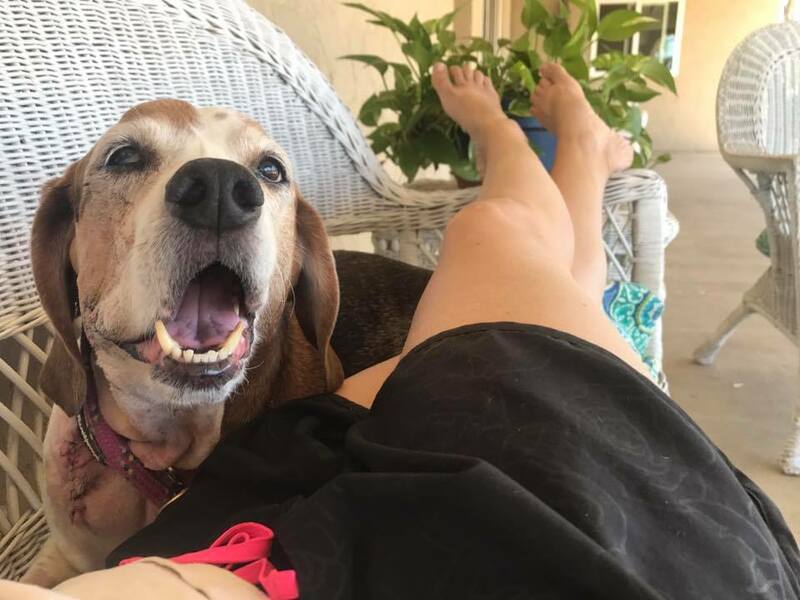 We will never forget your contagious smile, your speckled ears that you loved having rubbed or your goofy, bouncy greeting when we walked in the door. We had upcoming plans to celebrate the holidays and take you camping but am grateful that we celebrated your 6 month Frostiversary last month and that you had a beach trip just last weekend. Thank you to everyone involved at at Frosted Faces that gives these animals a second chance at family. Thank you to my family who accepted my idea of welcoming a senior dog into our home and ultimately fell in love with her too. Especially thank you to our Grandma girl for letting us be your family these past 7 months. We wouldn’t have changed it for the world except loving you sooner." Thank you to Angela Gunnett for always "showing up" for our Frosted Faces. Viviana was all love and you were a reflection of that love for her. Thank you to John Poytress for being Viviana's dedicated monthly sponsoring Fan. Tribute: Yesterday, on Tuesday February 26th, we fulfilled our promise to Beans. Beans was heavily networked for exit by the San Diego Humane Society along with her sister, Rice. Beans had a giant mass in her lung and her Rice was in kidney failure. It was a wonder who would be family to both girls requiring hospice care. Kim volunteers at FFF every Friday and when you see these Frosted Faces you sometimes get the phrase ringing in your head, "If not you, then who?" Not only did she and her husband commit to both Rice and Beans, they showed them the world. They went camping, strolling, SUPing, got regularly groomed, and ate home cooking. 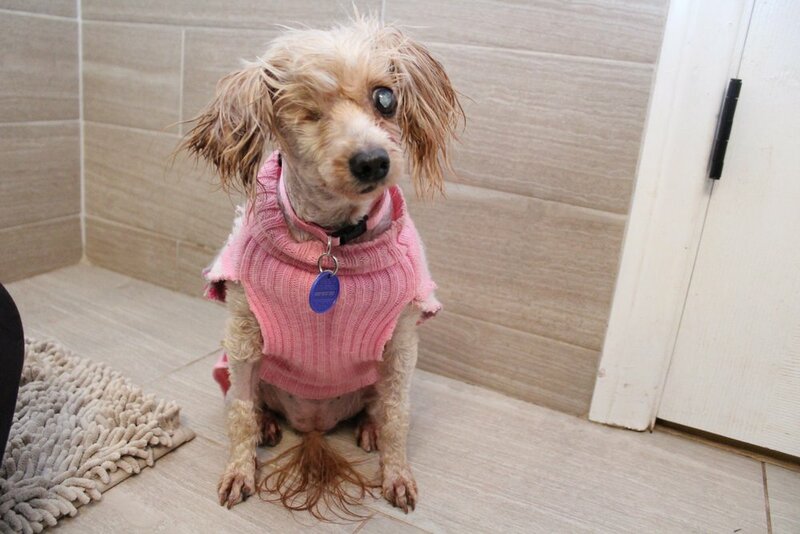 When Beans began to show signs of not living her best life, it was time to let her go. "We said goodbye to Beans today. We are terribly sad but know each time we see something beautiful she is still with us. We were worried about Rice, she seems alright, the dogs all were smelling us when we got back. The house won't be the same without the sheriff, but Deputy Rice will carry on security now." 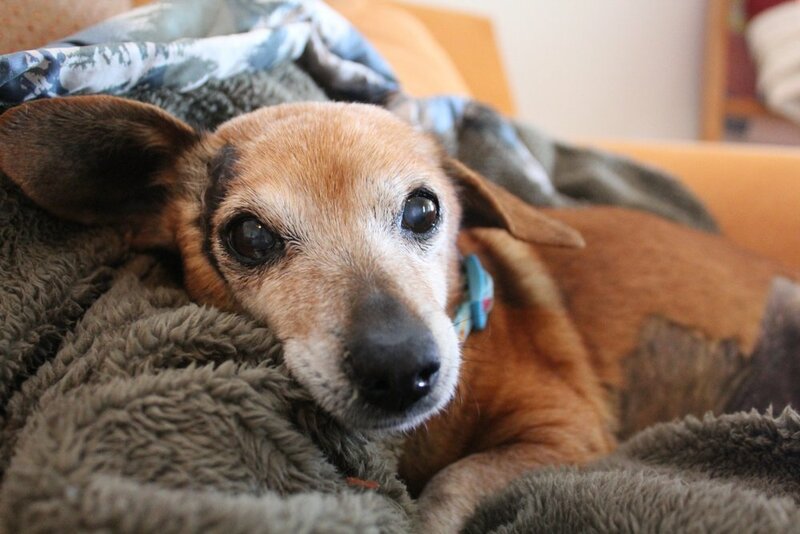 Tribute: On June 20th, we fulfilled our promise to 14 year old Scully. 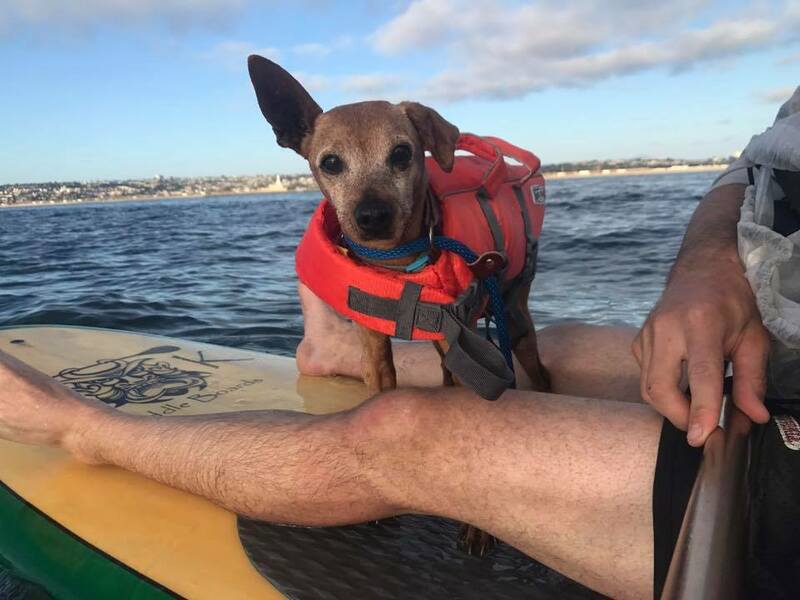 Scully, formerly Quotient/Scuttle, was brought up to San Diego from Tijuana by The Barking Lot and transferred into our care on April 6th, 2018. We enucleated his eyes for relief from trauma and placed him with the most devoted family. Soon after we learned that Scully had cutaneous lymphoma, and even with an appointment scheduled with the great Dr. Ogilvie, Scully declined very quickly last Wednesday leaving us no other options. "Scully went very peacefully. When I spent time with him this afternoon he was just very listless and had very shallow, rapid breathing. It all just happened so fast, he was not quite himself for the last couple of days. I suppose some may think that it is a blessing that he went so fast and did not suffer much. Scully was a precious soul and I admired his ability to trust so easily after being mistreated in the past. He loved to snuggle and ate like a vacuum. Recently he started to give Beth and me kisses on the face and even tried to practically lick her ear off. Thank you for supporting me today. There is no doubt that Scull he is in a better place, and that I will see him again and get to look at his big beautiful eyes." 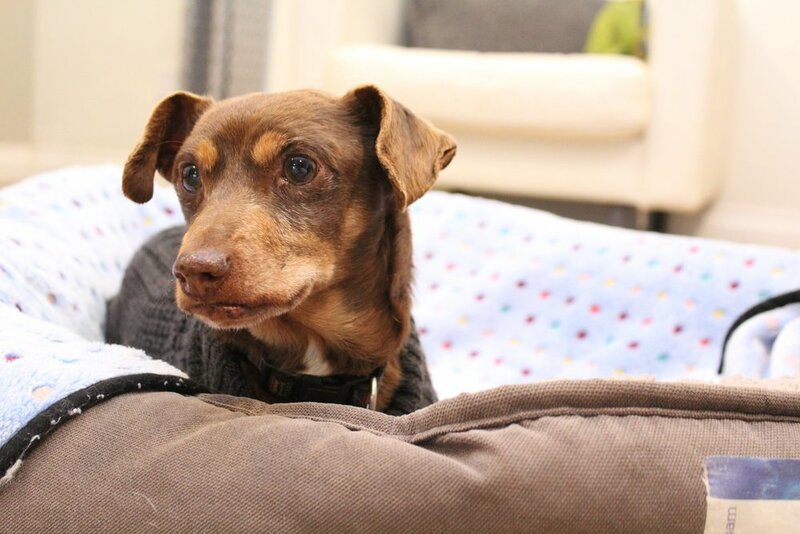 Thank you to Laura Backe and Beth Bowers for giving Scully only the best food, softest blankets, and most attention that he has deserved for a very long time. Thank you to Lori Frierson Jasinski for being Scully's dedicated monthly sponsoring Fan. Tribute: On Sunday, March 24th, we fulfilled our promise to 18 year old Nymh. After returning home from what was supposed to be a family fun vacation, turned stressful- bad turned to worse. Nymh had passed away the morning of our return sleeping in a ball under his cat tower. Our pet sitter said he was lively the night before and even ate all his food. We knew he had been struggling with kidney disease, hyperthyroidism, and a tachycardia. Nymh was such a lovable Frosted Feline, that even when he was relinquished back to FFF by his Forever Foster and we found a new family, Andy couldn't let him go. It was our nightly ritual to give him a Churu when we crawled into bed, and he would sleep on Andy's chest. His nails grew quickly and they would get caught in carpet, so we cut his nails often too, and he was such a good boy. Nymh was the bravest cat for "cat tests" with our Frosted Faces. He even got to be part of the Trick or Treat Trail and join the Halloween party with the crazy cat ladies. He was never fearful of the dogs and he loved being groomed by his pittie, Sawyer. We are mourning not having the chance to offer Nymh a peaceful death with euthanasia if he was suffering, but moreso regret not being home for him to have his last sleep with us. Tribute: May 31st, 2018, we fulfilled our promise to 10 year old Christina. The biopsy of her spleen came back as a mammary carcinoma. This is not good, it is rare, and means that her cancer was spreading. Just two weeks ago we took Christina to San Diego Bay Animal Hospital for congestion, and we learned that she had fluid build up around her lungs. We tapped it for her relief and found cancer cells. The time that we thought we had bought her after her major procedure got washed away. We were down to weeks or days with our girl. Christina had most really good days the last two weeks, and only a few bad days. We called her our zombie because she had come back from the dead, and when she was feeling good, she was a feisty one! She would chase and bite the heels of Duncan and Diesel if they got anywhere near her bed, and bite us if we tried to help her! There was a point last week where Christina was feeling better than her "okay" and was great! She came to check on me in the laundry room and followed me while I scooped poop in the yard. She never would have had the energy for that and it reminded me to slow down, scoop HER up, and smooch her all over her forehead and unusually tiny paws. Volunteers took Christina on special outing to eateries, a lake, parks, wineries, and held her longer than she probably desired! She slept between our pillows at night, in her final days I made a bed up for her near me while I cleaned kennels, and she ate anything she darn well wanted. Some donated lamb was her last meal before she declined all things delicious. When it's time, it's time. It was that obvious, science doesn't lie, and we whispered to her that she didn't have to be so tough anymore. We could hardly tell when she slipped away. Thank you to all of the Frosted Faces Foundation who loved on Christina. Thank you to Lisa Switzer for being her dedicated monthly sponsoring Fan. Tribute: On October 25th, 2018 we fulfilled our promise to 16 year old Sultan. We rescued Sultan on April 17th, 2018 from Bonita Shelter. He had advanced renal disease and we immediately began treating him. Being accustomed to dogs in kidney failure, we were astonished how long a Frosted Feline could live with a little "reboot" of fluids and hospitalization for a few days. Over the course of the last six months Sultan was hospitalized three times and discharged hydrated and bright! Sultan slept under our covers, even during the day he would burrow himself all on his own under there. He pawed at us relentlessly for attention, meowed for us to share our food, sat on the side of the bath tub when I was soaking, never leaving our sides when we were home. He was the most dog-like cat we have loved. Sultan was fearless to a fault and we used him to help us cat test Frosted Faces. He would bravely tell us whether the big guys could live with a meowmer like himself. Xander, Felissimo, and Trolley are just a few dogs that owe him thanks. Sultan bonded with our dog, Sawyer, and he would rub his body against his face purring while Sawyer groomed him. By the fourth time we hospitalized Sultan, he could no longer go on. His temperature began to drop dangerously low and we were called in to put him to sleep. Andy explained that Sultan was not himself and completely lateral. When I arrived, Sultan peeled himself off the table to see me and sat up. It was heartbreaking to experience that attachment as we were faced with ending his inevitable suffering. Sultan fought so hard to stay here with us. He loved being part of our little family and its makes us sad that his body had other plans. Thank you to Tralynn Gray and Tonya Burdine for being Sultan's dedicated monthly sponsoring Fans. Thank you to Andy Smíšek for helping me with medications and fluids for our Sultan, and sparing some more room in bed. Tribute: On Sunday, September 9th, we fulfilled our promise to 12 year old Amelia. We rescued Amelia from Riverside Shelter on April 27th, 2018. She had a fractured arm that was atrophied and did not seem painful, but something in her neck area was never comfortable. She was evaluated by four different vets who all agreed it was some type of cervical nerve damage or a mass in that area causing pain. We struggled to get her to eat and she had on and off terrible diarrhea. It took us awhile to get her pain managed, find a diet she liked. When Matt and Rob insisted on bringing her home we were hesitant. We had come so far, Amelia was loved at FFF by all of the volunteers, and we were afraid of a decline or that they may not have the patience for all of the accommodations we made for 'Meles. We were totally wrong to think any of this. Matt and Rob were phenomenal as her family! They got her to eat every meal, they kept her clean, and she took all of her pills for them. When they first took her home we sent them an introductory email entitled "Amelia's Frosted Fling" with all of her information and how to follow FFF protocols. Somehow, from being Flingers to Forever Fosters, every single correspondence ended up in that email chain where we could reflect on their new love, photos, the struggles, the vet consults with new solutions, the concerns, and ultimately the heartache of realizing the end was near. We could not keep her comfortable which resulted in an emergent trip to San Diego Bay Animal Hospital where she was lateral, vocal, and wincing to every touch. We could not set her free fast enough, and even that decision was difficult because her eyes were bright. "Thank you all for everything. It’s funny that we’ve had this email for a few months and it’s always read “Amelia’s Frosted Fling!” The story with Amelia started with a Fling but ended with her being part of my family. Naturally I wish we had more time with her, but I am beyond grateful for the time I did get with her. She helped fill the hole in my heart from my own dogs passing and she made the loss easier. I hope that she felt the love I gave her and I hope her story ended with her happiness and comfort. I’ll miss her affection and how she would get my attention with one little lick on the back of my leg. Thank you all so much for the hours spent on helping give Amelia a happy end to her unknown story. Matt, Rob and Addyson 💚💜🧡"
Thank you to Matthew Minkalis & Robert Cottner for your patience, flexibility, and selflessness. Thank you to the Pearce Family for being Amelia's dedicated monthly sponsoring Fans.